I decided to take a trip to my favorite local fabric store earlier this week. I was looking for some fabric for my next quilt (details coming soon!) and as usual, I ended up with more fabric for my ever growing stash. Almost all quilters have a fabric stash and I am no exception. If I see a fabric I like, I am most likely going to buy it because there is not telling if I will ever be able to find that exact fabric again. I have a serious case of FOMO (fear of missing out) when it comes to fabric. This time I picked up some really cute cat fabric. I love cats (yes, I may be a crazy cat lady one day) and when I saw this fabric I knew I had to have it. The big shocker is that when I saw this fabric, I immediately knew what I wanted to do with it. I promise I will share that plan once it comes to fruition. The other fabric I bought is going to be some sore of Valentine’s Day quilt although I am not sure what pattern I am going to use yet. 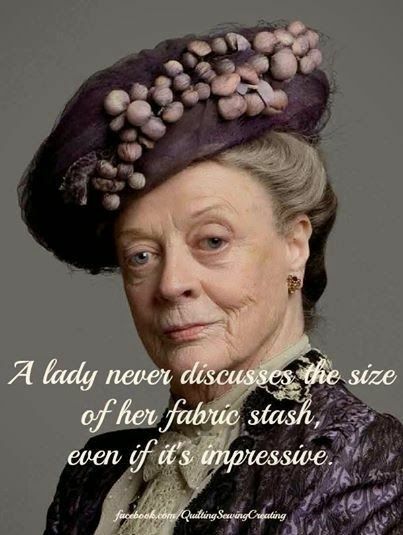 For now, I’ll let this Maggie Smith meme explain it all.